Free energy differences can be obtained through four different routes: (i) probability densities, (ii) free energy perturbation, (iii) thermodynamic integration, or (iv) nonequilibrium work approaches . Within NAMD, alchemical transformations are modeled following the second and the third routes, both of which rely upon the use of a general extent parameter often referred to as the coupling parameter [8,47,38,39] for the description of chemical changes in the molecular systems between the reference and the target states. where describes the interaction of the group of atoms representative of the reference state, , with the rest of the system. characterizes the interaction of the target topology, , with the rest of the system. is the Hamiltonian describing those atoms that do not undergo any transformation during the MD simulation. For instance, in the point mutation of an alanine side chain into that of glycine, by means of a free energy calculation -- either free energy perturbation or thermodynamic integration, the topology of both the methyl group of alanine and the hydrogen borne by the C in glycine co-exist throughout the simulation (see Figure 7), yet without actually seeing each other. Figure 7: Dual topology description for an alchemical simulation. Case example of the mutation of alanine into serine. The lighter color denotes the non-interacting, alternate state. The energy and forces are defined as a function of , in such a fashion that the interaction of the methyl group of alanine with the rest of the protein is effective at the beginning of the simulation, i.e. = 0, while the glycine C hydrogen atom does not interact with the rest of the protein, and vice versa at the end of the simulation, i.e. = 1. For intermediate values of , both the alanine and the glycine side chains participate in nonbonded interactions with the rest of the protein, scaled on the basis of the current value of . It should be clearly understood that these side chains never interact with each other. It is noteworthy that end points of alchemical transformations carried out in the framework of the dual-topology paradigm have been shown to be conducive to numerical instabilities from molecular dynamics simulations, often coined as ``end-point catastrophes''. These scenarios are prone to occur when becomes close to 0 or 1, and incoming atoms instantly appear where other particles are already present, which results in a virtually infinite potential as the interatomic distance tends towards 0. Such ``end-point catastrophes'' can be profitably circumvented by introducing a so-called soft-core potential [7,46], aimed at a gradual scaling of the short-range nonbonded interactions of incoming atoms with their environment, as shown in Equation 55. What is really being modified is the value of a coupling parameter ( or ) that scales the interactions -- i.e., if set to 0, the latter are off; if set to 1, they are on -- in lieu of the actual value of provided by the user. Here, , where is the Boltzmann constant, is the temperature. and are the Hamiltonians describing states and , respectively. denotes an ensemble average over configurations representative of the initial, reference state, . 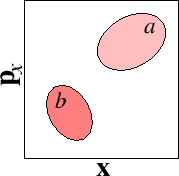 Figure: Convergence of an FEP calculation. If the ensembles representative of states and are too disparate, equation (56) will not converge (a). 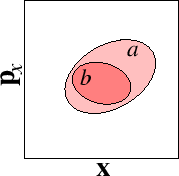 If, in sharp contrast, the configurations of state form a subset of the ensemble of configurations characteristic of state , the simulation is expected to converge (b). 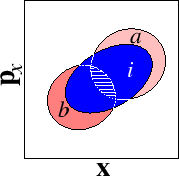 The difficulties reflected in case (a) may be alleviated by the introduction of mutually overlapping intermediate states that connect to (c). It should be mentioned that in practice, the kinetic contribution, , is assumed to be identical for state and state . Here, stands for the number of intermediate stages, or ``windows'' between the initial and the final states -- see Figure 8. In the multi-configuration thermodynamic integration approach  implemented in NAMD, , the ensemble average of the derivative of the internal energy with respect to , is collected for a series of discrete values and written to tiOutFile. These values are analyzed by the separately distributed script NAMD_ti.pl, which performs the integration of individual energy components and reports back the total values for the transformation.